nikakihijau: The healthiest Bread in town! Today I would like to share with everyone the healthiest bread in town to date. 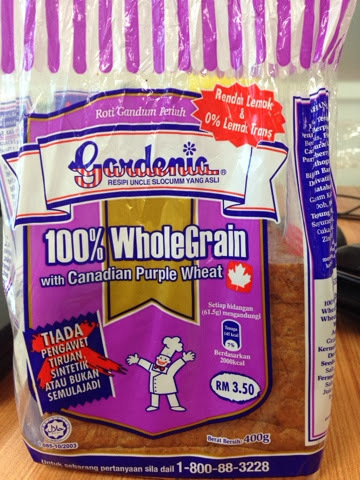 It is from Gardenia and it is called 100% WholeGrain with Canadian Purple Wheat. The presentation is nice. The message is clear stated. One of the reasons why I mentioned it is the healthiest bread in town is due to its low GI value. GI means Glycaemic Index, which provides a measure of how quickly blood sugar levels (exp level of glucose in the blood) rise after eating a particular type of food. 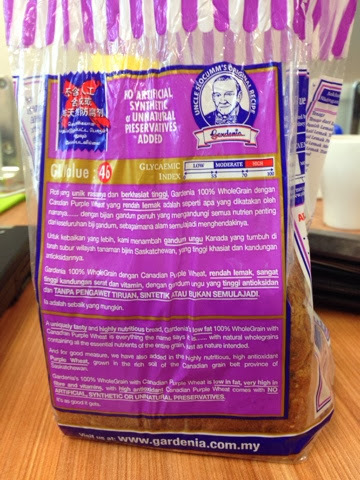 As shown in the picture above, the GI value for this bread is 46. 46 indicates the GI value is low, which is good for us. 1. A food with low GI value will prompt a moderate rise in blood glucose. 2. A food with high GI value may cause our blood sugar levels to increase above optimum level. How do you classified GI value? 4. The Canadian Purple Wheat comes with No Artificial, Synthetic or Unnatural Preservatives. The taste is okay I would say. I hope this information will be useful to everyone.